The holidays are always a great time to reflect upon the past year in online marketing. Looking back at 2009, it’s interesting to analyze how various companies utilized new technologies and marketing channels to increase sales and engage prospective customers. I feel fortunate to be in a position where I get to speak with many marketers from a wide range of companies (both large and small) to learn which tactics they are using to grow their businesses. I think it’s been an amazing year, with Search, Social Media, and Mobile attracting a lot of attention from a wide range of companies and organizations. However, looking back on my conversations and projects over the past year, it’s hard to ignore the lack of resources available to ultra small businesses. These small businesses unfortunately don’t have the time or budgets to tackle online marketing the way larger companies can. They also happen to be a critical component of our economy, so it just doesn’t seem right. To me, ultra small businesses are companies run by one or two individuals, employ less than ten people, generate under $500K per year in revenue, and move at light speed to keep their businesses moving. Ultra small businesses are critically important for our economy, but tend to be overshadowed by news from larger brands and companies. As article after article is written about multi-billion dollar powerhouses, the small business owner remains somewhat anonymous. Yet, those very business owners in aggregate employ millions of people and are an important part of the framework of commerce in the United States. This got me thinking. 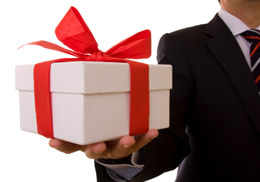 What could I do this holiday season to help a small business start 2010 the right way? Let’s face it, many small businesses don’t have the time to learn about the latest in online marketing and how to leverage those tactics to increase sales. But, just because they don’t have huge budgets and big brand names doesn’t mean they have to be left out in the cold! So in the spirit of the holidays, I decided to launch The “Search a Small Business” Holiday Giveaway here at G-Squared Interactive. Over the next week, small businesses that meet the requirements listed below can simply send us an email to enter the contest. The winning business will receive a free online marketing audit, which includes an analysis of how their current website is performing. And more importantly, the analysis will provide recommendations for improving the website and various online marketing efforts. Insights from the analysis could include recommendations for improving Search Engine Optimization (SEO), Paid Search (SEM), Social Media Marketing, Website Optimization, and Web Analytics. The goal is to help the winning company quickly understand changes that can impact its business. The analysis will be performed by myself and Matt Leonard, an incredibly smart online marketer and good friend of mine that has agreed to help. For those of you on Twitter, Matt is @mjleonard and you should follow him now if you aren’t already. Together, we plan to arm a small business with key information for improving its online marketing efforts. Please review the following requirements before entering the contest to make sure your business is eligible. * Have less than 10 employees. * Be located less than 60 miles from Princeton, NJ and be a NJ business. This is because Matt and I will present the results to you in person at your office. I recommend you check Google Maps to see if you are eligible. * Be willing to let us write follow-up blog posts about the giveaway and project. We would like to provide updates about how the winner is using the information provided in our analysis. * Be willing to make changes! The analysis can only go so far. You will need to act on the recommendations in order to see an impact. To read the official rules and regulations, please click here. So let us help your business start off 2010 with the right online marketing strategies in place! Enter now by emailing us at smallbizmarketing@gsqinteractive.com. Be sure to include all of your contact information so we know how to get in touch with you, including your full name, business name, business address, number of employees, phone number, and website URL. We will be accepting emails for the contest from Monday, December 7th, 2009 through Monday, December 14th, 2009. We will announce the winner on December 15th on this blog (and directly contact the winner via the information they provide when entering the contest).